Dozens of University of Missouri–St. 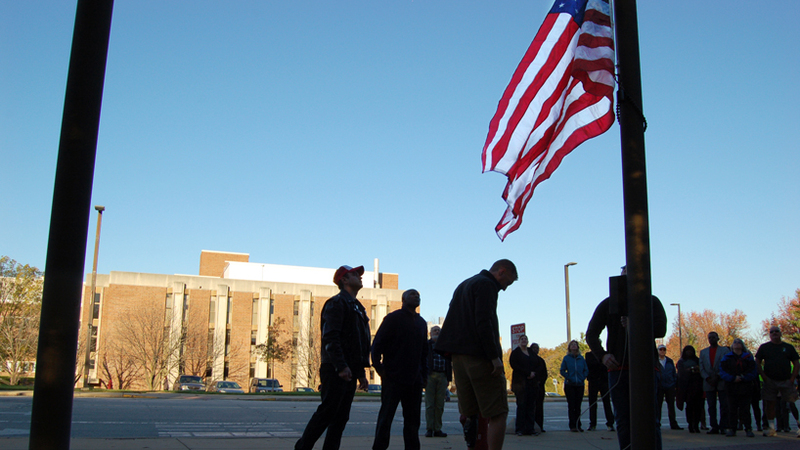 Louis students, faculty and staff assembled outside Woods Hall early on Nov. 11 – Veterans Day – for a ceremony to raise the American flag and sing the national anthem. The event preceded an open house at UMSL’s Department of Military and Veteran Studies. The number of military veterans enrolling at UMSL has been steadily increasing over the past five years, in large part because of the campus’ commitment to create the department and associated Veterans Center to focus on the unique needs of veterans. These efforts have been lauded by veterans and are gaining national recognition as well. Earlier this month, UMSL learned that Military Times had again designated it as a “Best for Vets” college. UMSL ranked 40th nationally among the 130 colleges receiving the recognition. Victory Media last week named UMSL to its 2017 “Military Friendly Schools” list. It’s the second year the campus earned that distinction.